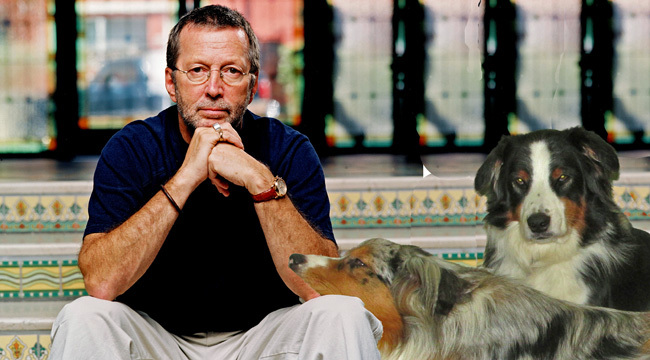 ERIC CLAPTON ON CROSSCURRENTS, 3/30 – Doggedly Yours… Howling, Humor, and History. ERIC CLAPTON ON CROSSCURRENTS, 3/30: Having the nickname “Slowhand,” Eric Clapton was born on this date in 1945, he became known for his energetic, precise, and bold guitar work. Gavin and Wyatt pose next to their hero in hopes of a biscuit. You can join Clapton’s birthday party with “yard birds” flying in “blind faith” through “cream” toward “dominos” on Crosscurrents, 3/30 at 8 a.m.